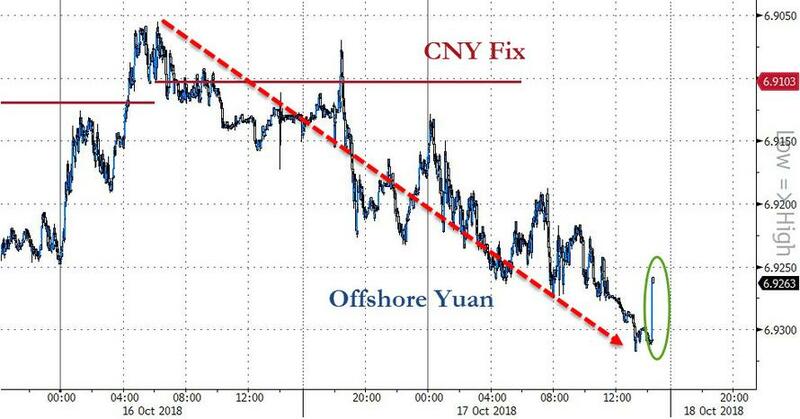 Offshore Yuan bounced back from below 6.93/USD after the well-telegraphed report from the US Treasury once again decided not to label China "a currency manipulator" averting any further escalation (for now) in the 'war' between the two nations. 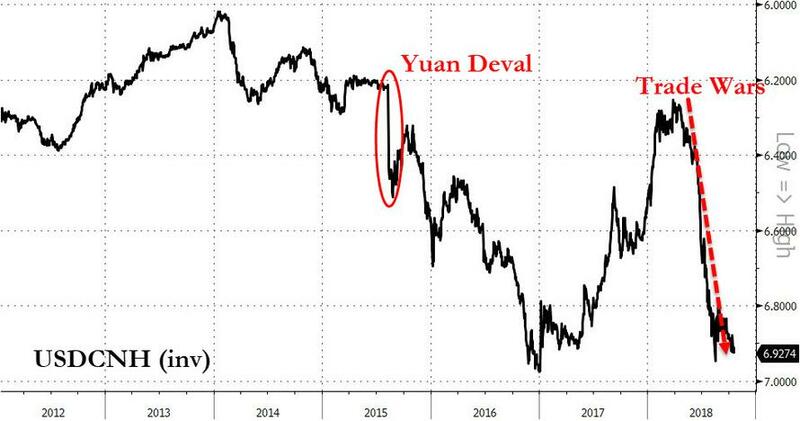 Based on the analysis in this Report, Treasury determines, pursuant to the 2015 Act, that China continues to warrant placement on the Monitoring List of economies that merit close attention to their currency practices. Treasury determines that while China does not meet the standards identified in Section 3004 of the 1988 Act at this time, Treasury is concerned about the depreciation of the RMB and will carefully monitor and review this determination over the following 6-month period, including through ongoing discussions with the PBOC. China continues to run an extremely large and persistent bilateral trade surplus with the United States, by far the largest among any of the United States’ major trading partners, with the goods trade surplus standing at $390 billion over the four quarters through June 2018. As discussed above, recent depreciation of the RMB will likely exacerbate China’s large bilateral trade surplus with the United States, as well as its overall trade surplus. Treasury places significant importance on China adhering to its G-20 commitments to refrain from engaging in competitive devaluation and to not target China’s exchange rate for competitive purposes. China could pursue more market-based economic reforms that would bolster confidence in the RMB. Treasury continues to urge China to enhance the transparency of China’s exchange rate and reserve management operations and goals. Treasury is deeply disappointed that China continues to refrain from disclosing its foreign exchange intervention. Finally, to enhance the sustainability of both Chinese and global growth, China needs to aggressively advance reforms that support greater household consumption growth and rebalance the economy away from investment. Treasury staff estimate that the PBOC has refrained from intervention to counter depreciation pressures. 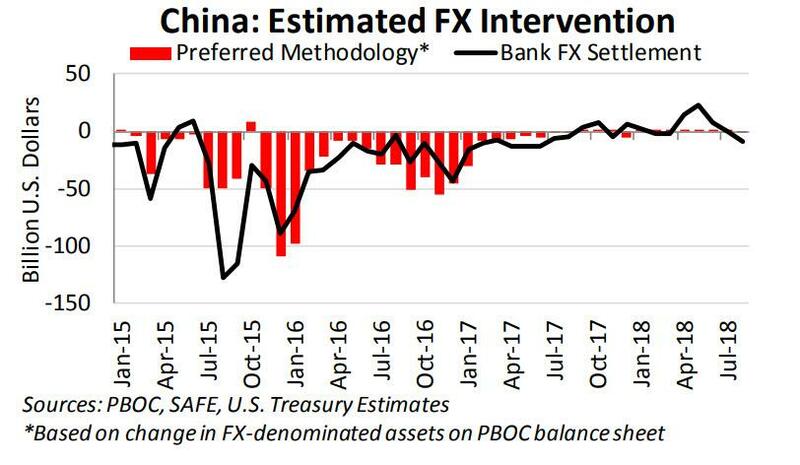 The same broader measure that indicated foreign exchange was purchased by entities beyond PBOC in the second quarter showed that there were foreign exchange sales of around $10 billion by the same set of entities in August. No major trade partner was designated a currency manipulator, but Treasury did up the negative rhetoric against China’s state-driven economic model. “Real exchange rate movements in 2018 -- particularly the strengthening of the dollar and the decline in China’s currency -- would, if sustained, exacerbate persistent trade and current account imbalances,” according to the report. However, Treasury’s currency watch list remained the same: naming China, Japan, South Korea, India, Germany and Switzerland. Finally, Bloomberg notes that the decision not to label China a manipulator stands in contrast with public comments made by President Donald Trump, who has repeatedly accused China of gaming the value of the yuan to gain an advantage in trade. India now only meets only one of the three criteria to be labeled a currency manipulator, compared with two in the April report. The country could be removed from the monitoring list next April.